The Canadian love affair with hops and barley continues, but more and more drinkers are opting for the grape. Beer remained the alcoholic drink of choice for Canadians, with $9.1 billion in sales and accounting for 40.6% of total sales of alcoholic beverages in 2016/2017. However, the market share of other alcoholic beverages, notably wine, continued to grow. Liquor stores, agencies and other retail outlets sold $22.5 billion worth of alcoholic beverages during the fiscal year ending March 31, 2017, up 2.3% from the previous year. The total volume of alcohol sold in 2016/2017 edged up 0.1%, to 3,074 million litres. The net income realized by provincial and territorial liquor authorities increased by 7.0% to $6.5 billion in 2016/2017. All liquor authorities reported positive net income in 2016/2017, however 7 out of 13 jurisdictions reported lower net income compared with the previous fiscal year. Net income and other government revenue derived from the control and sale of alcoholic beverages, including excise taxes, retail sales taxes, specific taxes on alcohol, and licence and permit revenues, was $11.9 billion in 2016/2017, an increase of 3.9% over the previous fiscal year. Liquor stores, agencies and other retail outlets sold $9.1 billion worth of beer during the fiscal year ending March 31, 2017, up 0.7% from the previous year. Canadian beer sales edged up 0.4%, while imported beer sales rose 2.1% in 2016/2017. 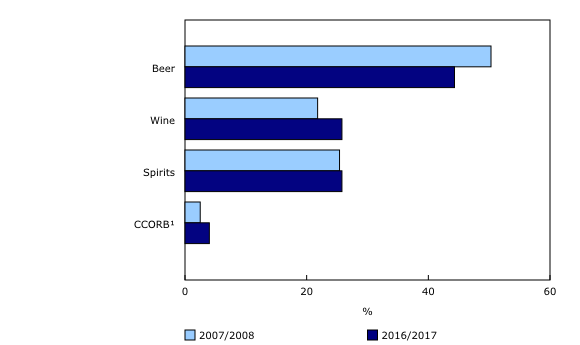 Beer sales had the greatest market share of total alcoholic beverage sales in Nunavut (60.0%) and the lowest in British Columbia (34.4%). The Northwest Territories reported the greatest increase in beer sales (+5.1%), while Alberta reported the largest decrease (-5.9%). The average annual growth rate of total beer sales over the past 10 years was 1.3%. Sales of Canadian beer grew at an annual average rate of 0.9% over the past decade, while imported beer sales increased, on average, by 3.6% annually over that time. In terms of volume sold, liquor stores, agencies and other retail outlets sold 2,234 million litres of beer in 2016/2017, down slightly from 2015/2016. This volume is equivalent to 109.5 million litres of pure alcohol, or 221.5 bottles of beer sold per person over the legal drinking age in Canada (1 bottle = 341 ml, 5% alcohol content). The volume of Canadian beer sold decreased to 1,897 million litres, down 1.0% from the previous year, while imported beer sold decreased 0.2% to 336 million litres. Average annual beer sales (in volume) have been declining at a rate of 0.3% over the last decade. Liquor stores, agencies and other retail outlets sold $7.2 billion worth of wine during the year ending March 31, 2017, up 3.1% from the previous year to 32.0% of total alcohol sales. All provinces and territories reported gains, except for Alberta and Nunavut. The Northwest Territories posted the highest growth at 14.1%, followed by Prince Edward Island at 8.2%. Canadian wine sales grew by 6.9%, while imported wine sales were up 1.4%. Wine sales had the greatest market share in Quebec at 43.7% of total sales of alcoholic beverages, while the lowest was in Nunavut at 11.4%. Red wines accounted for 53.4% of total wine sales in Canada in 2016/2017, followed by white wines (32.3%) and sparkling wines (5.6%). Rosé, fortified and other wines accounted for the remaining wine sales. Imported red wine sales accounted for 74.2% of all red wines sold in 2016/2017, down from 76.9% in 2007/2008. The share of imported white wines increased marginally, rising from 59.5% in 2007/2008 to 59.9% in 2016/2017. In terms of volume, wine sales increased 1.8% from 2015/2016 to 505 million litres in 2016/2017. This volume is equivalent to 63.8 million litres of pure alcohol, or 24.5 bottles of wine sold per person over the legal drinking age in Canada (1 bottle = 750 ml, 12% alcohol content). The growth in volume of Canadian wine (+3.7%) outpaced that of imported wine (+0.5%). Liquor stores, agencies, and other retail outlets sold $5.3 billion worth of spirits during the year ending March 31, 2017, up 3.2% from the previous year. Spirit sales had the greatest market share in the Northwest Territories at 39.4% of total sales, and the lowest in Quebec at 13.7%. Canadian spirit sales increased 2.4%, while imported spirit sales increased 4.1%. At the national level, whisky (31.3%), vodka (24.8%) and rum (17.1%) were the most popular spirits sold in Canada in 2016/2017, accounting for nearly three-quarters of all spirit sales. At the provincial/territorial level, whisky had the greatest market share in Ontario, at 38.0% of spirit sales for the province, with the lowest market share in the Northwest Territories (14.9% of spirit sales). Vodka constituted the highest proportion of spirit sales in Nunavut (56.1% of spirit sales) and the lowest in Newfoundland and Labrador (15.7%). Rum was the top choice for spirits in Newfoundland and Labrador (45.3% of spirit sales), with the lowest proportion sold in Yukon (12.8%). The average annual growth rate of spirit sales over the last 10 years was 2.7%. Canadian spirit sales grew at an annual average rate of 1.1% over the past decade, compared with an annual average growth rate of 4.8% for imported spirits. In terms of volume, the amount of spirits sold increased 2.4% in 2016/2017 to 168.0 million litres. This volume is equivalent to 63.7 million litres of pure alcohol, or 7.3 bottles of spirits sold per person over the legal drinking age in Canada (1 bottle = 750 ml, 40% alcohol content). Sales of Canadian spirits totalled 95.2 million litres, up 2.3% in 2016/2017, while the volume of imported spirit sales increased by 2.5% to 72.8 million litres. The share of spirit imports has been on the rise for several years, increasing from 37.0% of spirits sold in 2007/2008 to 43.4% in 2016/2017. Liquor stores, agencies, and other retail outlets sold $0.9 billion worth of ciders, coolers, and other refreshment beverages (CCORB) in 2016/2017, up 8.2% from the previous year. 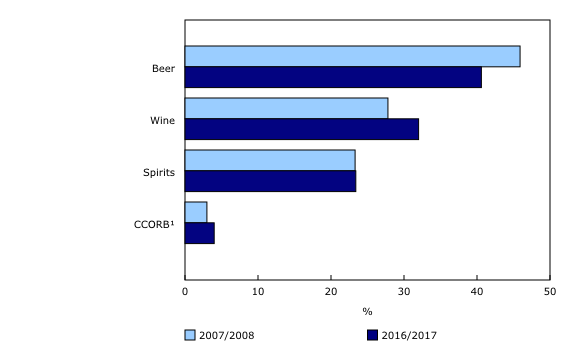 CCORB sales had the greatest market share in Yukon at 7.2% of total sales of alcoholic beverages, and the lowest share in Quebec at 1.2%. 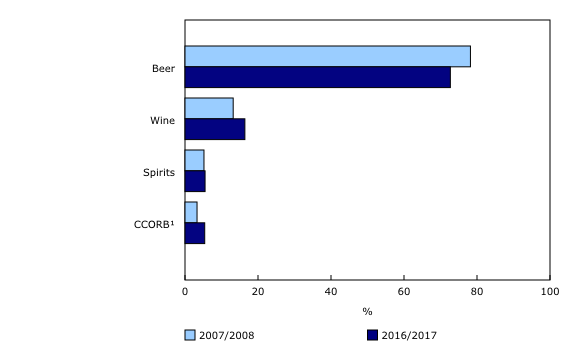 In terms of volume, liquor stores, agencies and other retail outlets sold 167 million litres of CCORB in 2016/2017, up 6.8% from the previous year. The 167 million litres of CCORB sold, or 9.9 million litres of pure alcohol, is equivalent to 20.0 bottles of ciders, coolers, and other refreshment beverages sold per person over the legal drinking age in Canada (1 bottle = 341 ml, 5% alcohol content).The average annual growth rate of CCORB sales over the last 10 years was 6.4%. Canadian CCORB sales grew at an annual average rate of 4.6%, while imported CCORB sales increased at an annual average rate of 13.9%. Statistics on sales of alcoholic beverages by volume should not be equated with data on consumption. Sales volumes include only sales as reported by the liquor authorities and their agencies, including sales by wineries, breweries, and other outlets that operate under license from the liquor authorities. Consumption of alcoholic beverages would include all of these sales, as well as any unreported volumes of alcohol sold through ferment-on-premise operations or other outlets, and any unrecorded or illegal transactions. Statistics on sales of alcoholic beverages by dollar value should not be equated with consumer expenditures on alcoholic beverages. The sales data refer to the revenues received by liquor authorities and their agents, and a portion of these revenues include sales to licensed establishments such as bars and restaurants. The value of sales of alcoholic beverages excludes all sales taxes, the value of returnable containers, and deposits. Absolute volume of sales of alcoholic beverages is calculated by multiplying the sales volume by the percentage of alcohol content for each product category. The infographic "Alcohol Sales in Canada," which is part of Statistics Canada — Infographics (Catalogue number11-627-M), is now available.